The Road Warrior. 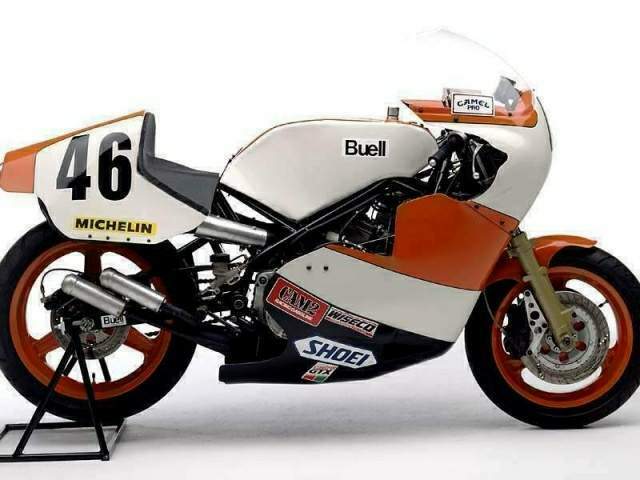 A 2-stroke square four originally designed by Barton in North Wales, but with the engine and chassis redeveloped by Buell to create a pure race bike for use in the AMA F1 Class ... just before they abandoned it for Superbikes. Just what the heck is a Buell RR1000 anyway? The year is 1985. A young ambitious engineer has recently quit a nice job at Harley Davidson to launch a company building AMA formula 750 race bikes. He mortgages the house and hocks everything he has to produce the first one. Cycle Magazine does a major feature on the bike, all the other bike magazines run nice pieces on it. He is off and running. Then the AMA drops the class. Overnight there is no market for these bikes. The engineer goes broke. And therein hangs a tale. 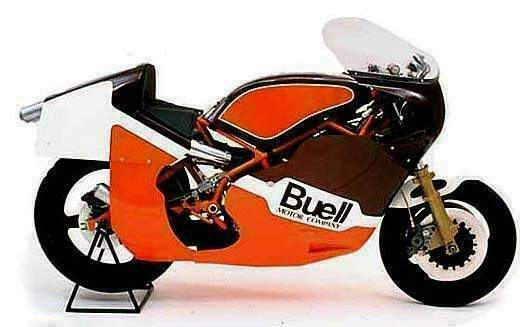 The engineer was of course Erik Buell and the bike was the RW750. A wicked siren of a bike it has its own tale but this is not the place for that. The magazine stories on the RW750 caught the eye of Rex Marsee. He had the commission to come up with a motorcycle celebrating 100 years of American Motorcycling for the Great American Motorcycle Show. He asked Erik for a street version of the RW750 to represented the latest in American motorcycle design. Erik had two reasons for talking Marsee out of it. The one he used was that it was a pure race bike impossible to translate to the street. He argued that he could design a bike that was just as wild using the Harley XR-1000 engine. This bike would be street legal and for sale to the public. Marsee bought it. The second, the one he did not mention to Marsee, was that he had been in contact with the Harley Owners Group about designing a replacement for the aging Lucifer’s Hammer. This was Harley’s championship Battle of the Twins race bike. It had plenty of power but the superior handling of the Ducati’s was making it tougher to win races. If he could combine the two jobs, essentially designing one bike for two uses he might actually make the whole deal work. Behind the whole deal was Erik’s belief that if he could get a prototype and a race bike done he could talk HD into selling him the 50 XR-1000 engines gathering dust in the Parts and Accessories warehouse. Then all he had to do was build and sell 50 bikes. Lets pause here and think about what this meant. Not only was this flat broke unemployed individual going to a talk HD into supplying him engines and other parts (on credit no less) he was going to go into series production with the resulting bike. This would make him the first American to start a street motorcycle manufacturing company since the 1920’s. Of all the companies started before that only one was left standing (staggering might be a more appropriate term) in 1985 and that was HD. And the bike would need to meet ALL Federal noise, smog and safety regulations. (The book these regs are in is 6 inches thick.) Long odds indeed. But before he got to the hard part he had to tackle the easy task (said with tongue firmly in cheek) and design a bike. Erik’s idea was, typically for him, ambitious. An XR motor in flashy bodywork would have made Marsee happy. A bike fast enough to beat the Ducati’s, this is before Ducati started notching up world championships remember, would have satisfied HOG. None of this was good enough for Erik Buell. This was going to be an American superbike. Superbikes of the time were big 750cc 4 cylinder Japanese street bikes. Brutally fast with powerful engines their street bike origins were revealed by suspect handling, extra weight and size. These things were large. The also ran in the premier AMA racing class and competed in the world’s most celebrated race the Daytona 200. To Erik a superbike needed to compete with these bikes, not just Ducati’s, BMW’s and Moto Guzzi’s. That is what Erik set out to do, build a bike that could win the Daytona 200. Erik had at his disposal a heavy engine that didn’t make nearly enough power. It was large and shook like a paint mixer. Erik of course saw the positives; you could get pretty good power out of it with some work, it made a whole lot of torque with a wide powerband, it was relatively short for a V-twin, it had a lot of possible dealers, and most importantly he could get 50 so it would qualify as a production bike by AMA standards and most brilliantly it only shook in one plane. With access to a high speed cad package Erik entered the engines dimensions, drew a wire frame of a chassis, modeled the stresses and …wait, wait, I must have fallen asleep and been dreaming. Erik had a Mac Plus and a dot matrix printer. He had to figure this stuff out in his head. Erik’s cad package consisted of setting an engine on a workbench, tacking a couple of tubes around it and than staring at it for hours. Literally. You would find Erik out in his garage staring a pile of tubing and an XR motor. He wouldn’t move for 20 minutes, then he would shift a tube and stare some more. You could ask him a direct question and he would not hear you, or he would answer ten minutes after the question was asked. Truth be told Erik’s head was packed with data from the testing he had done on the FXR chassis package. His knowledge of motorcycle chassis behavior would rival anyone’s in the world. And he had a little help. H-D provided computer time to do calculations. He was able to model different tube materials and do some stress analysis. Mostly this just confirmed that Erik was right. The frame he came up with is not much different than the one in use on Buell’s today. Sure the high tech stress analysis stuff and 3 dimensional modeling have resulted in a frame that is a little cheaper to produce with some improvements to serviceability and rider comfort but in terms of stiffness to weight; 5 will get you 10 that the original is better. Then the bodywork was developed. Maximum top speed and fuel economy were the goals. A really good understanding of aerodynamics plus access to some Caltech wind tunnel research lead to the huge body work. Every detail of the flow was attended to. A 5’10" rider is needed to complete the package. Airflow over the riders back and legs keeps the boundary layer intact from the point of first penetration to the end of the tail. It is still the slipperiest production motorcycle ever produced. The result was the RR1000. A tiny bike the wheel base is only 53.5 inches with a very steep 25 degree steering head angle and only 4.6 inches of trail. The wheels are 16" with dual 320 mm rotors in the front. The maximum lean angle is 55 degrees with a dry weight of only 395 pounds (the engine weighed 200 pounds!). The dimensions are much closer to contemporary GP numbers than the superbikes of the time. The bike proved to be a superb handler and the aerodynamics were spot on. The looks attracted crowds at the bike shows and when Don Tilley and Gene Church arrived at Daytona it was hugely fast. Unfortunately the bike was not ready for the early practice sessions and Church only got a few laps in never really nailing a full fast lap. This would prove the end of his career. When race day arrived the bike was ready and Church was pumped. It jumped out to a huge lead on lap one, it’s 178 mph through the speed trap pretty much put all the Ducati’s on the trailer (hell that number was as fast as the superbikes ran just a few years ago) but when Church hit his brake marker for turn one he was going about 30 mph faster than the old Lucifer’s Hammer had ever gone. Tucked in behind the big windscreen there is little wind noise and his perception of how fast he was going was way, way wrong. To compound his problems as turn one blasted toward him the gearbox, a very trick, one-off, close-ratio 5 speed, picked that moment to do it's favorite trick, a false neutral. Church never had a chance. He slammed into the hay bales somersaulting the bike and badly breaking his wrist. The chassis was so strong that it was undamaged. Church would make a return to racing in June at Road America but crashed again re-injuring the wrist. He retired. Tilley did not have a back up rider and was not real interested in racing without Church. While all this was going on Erik had been smuggled on board the annual H-D dealer cruise and taken orders for 25 bikes. He talked H-D into extending him credit and supplying him with all the XR motors left on as needed basis. Bikes began rolling out the doors of the shop in MukWonago at a rate of about two a month. Unfortunately most of them were snapped up by collectors. Only a handful ever raced. A bike in New Zealand won the BEARS championship there in 1989, one in Japan won some races there, while the London based H-D dealer John Warr campaigned one in Europe with some success. Here in the US Clark Ohstrom ran one in C.C.S races, winning several and eventually taking third in the 1990 championship. That year Scott Zampach won that championship, run at Road Atlanta, so easily that the AMA changed the rules effectively outlawing the bike. While the bike never really got a fair shot at the race track and never even entered the Daytona 200, the race that Erik dreamed about, they did show that they had the ability to run with some of the fastest bikes in the world.